Use this vanity to bring more traditional style into your bathroom. Its white marble counter and white solid wood base will look beautiful in your home. This set from Avanity is great for anyone looking for great style and function in their bathroom. The Emma 61 inch vanity combo embraces purity of design and masterful construction. The vanity inWhite finish paired with black bronze hardware brings to life the cabinet's simple, clean lines. Emma provides abundant storage and Zen-like functionality. Soft-close glides and hinges keep things quiet and the solidwood frame and dovetail joints keep things strong. It includes a carrera white marble top and dual rectangular undermount sinks. The collection also features complementary mirror and linen tower to expand the look. Emma makes your bathroom beautiful. For some added traditional style in your bathroom, choose this beautiful vanity. With a beige tan marble counter and white solid wood base, this piece is very stylish. Its drawers and roomy double-door cabinet are great to keep bathroom items in. Put together your perfect bathroom with this stylish vanity set from Avanity. 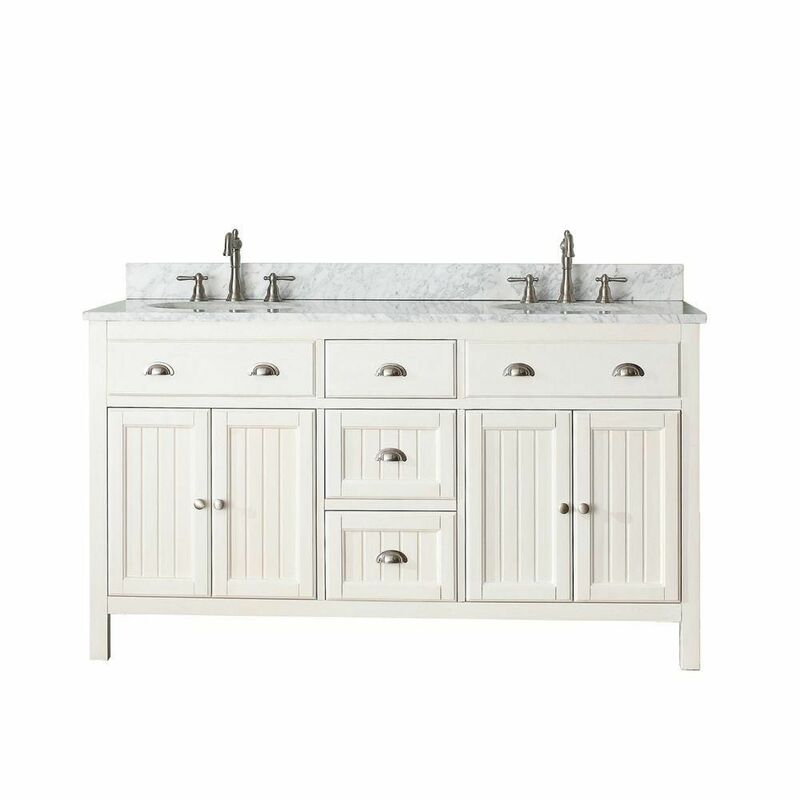 Hamilton 61-inch W 3-Drawer 4-Door Vanity in White With Marble Top in White, Double Basins Use this vanity to bring more traditional style into your bathroom. Its white marble counter and white solid wood base will look beautiful in your home. This set from Avanity is great for anyone looking for great style and function in their bathroom.